The first of the 6 races organized by the Irish National Flying Club was held on Tuesday 29th May from Skibbereen in County Cork. Overall 392 members sent 3,588 birds to compete for £13,442 in pools and prizemoney, down on the season previous. Liberation was at 8.30am in a Lt Northerly wind and the early birds made good time as usual. The race was sponsored once again by Bamfords Top Flight and we are very grateful to them for their continued sponsorship. The race took the same format as previous few years with the Ronnie Johnston Challenge Cup and Diploma awarded to the Overall winner and the Gerald Delaney Trophy awarded to the best velocity of the other two sections. The winner of 1st Section with the lowest winning velocity will receive a coveted INFC Diploma. There are no INFC Open positions for the Skibbereen Nationals but prizes are allocated to the three sections. As the result is divided into 3 sections I intend to cover the Top 5 in the three sections in this article as has been past practice. Race winner and 1st South Sect was won by P J Nangle of Carlow & District recording velocity 1308, 1st North Sect was Ronnie Williamson from Newry & Dist 1226 and 1st Middle Sect was Derek Tierney of the Sarsfield RPC in Dublin 1264. P J Nangle wins 2 bags of mixture with 3 bags each going to R Williamson NIPA, J Ward & Son Ulster Fed, J Patterson East Down Combine, T & T Moorehouse & Grandson ECF, P Quirke SLF and D Tierney ISRF. Homers Odyssey will feature Centre Results, Combine & Fed Results and Club Results. The INFC Committee are grateful once again for all the help at the race marking, and also all those involved in the various Clock Centres across Ireland, every little bit of help is appreciated. On a personal note thanks to all those who supplied text and photos for this report or helped in any other way. The more info we get the better job can be done. Tuesday 29th May 2018. 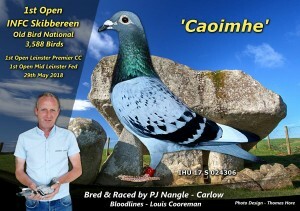 Skibbereen Old Bird Inland National Sponsored by Bamfords Top Flight. 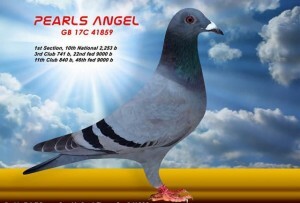 392 members have entered 3588 pigeons and are competing for £13,440.00 pools and prize money. 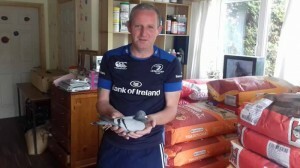 The pigeons have been released at 08.30am wind at the release site was a light Northerly. Sponsorded by Bamfords Top Flight. Race marking will take place as planned on Monday 28th May times as printed in the race entry form booklet for a possible release on Tuesday. Results & Reports click here! THE FORUM PAGE IS UPDATED DAILY.